“For these among other reasons, Ireland—resolutely and irrevocably determined at the dawn of the promised era of self-determination and liberty that she will suffer foreign dominion no longer—calls upon every free nation to uphold her national claim to complete independence as an Irish Republic against the arrogant pretensions of England founded in fraud and sustained only by an overwhelming military occupation, and demands to be confronted publicly with England at the Congress of the Nations, that the civilised world having judged between English wrong and Irish right may guarantee to Ireland its permanent support for the maintenance of her national independence”. 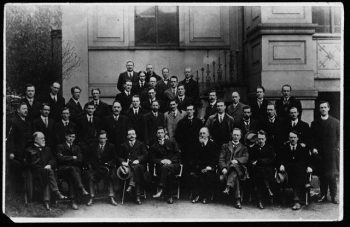 On January 21, 1919, it is with this proud message that it addresses, from the Round Room of the Mansion House in Dublin, to the nations agreed at the Congress of Paris, the Dáil Éireann, the first Irish parliament, which has just solemnly declared the independence of Ireland: of its 105 theoretical members, there are only a little more than twenty, and well 23 are held or fugitional, following the bloody insurrection of 1916 (Easter Rising). For too long Britain has postponed the approval of a measure which recognizes at least the autonomy of the Irish Catholic Counties: the Great War has broken out from the last, while in the English Parliament there was a very hard clash just on this matter. Many Irish had rushed to the front to demonstrate their loyalty to the British cause, without obtaining any kind of recognition: among other things, that had provoked the insurrection of 1916 and the consequent merciless British repression. On December 14, 1918, the British elections had demonstrated the success of the Independence party Sinn Fein (We Alone ), which had obtained well 73 of the 105 Irish seats: for which it had been natural for the independentists to decide not to sit more at Wstminster, but to To create its own autonomous Democratic-parliamentary body. Moreover, precisely the opening of the Paris conference, it fueled the hopes of success, applying the principle of self-determination contained in the fourteen Points of Wilson. Hopes strengthened by the presence of a strong and authoritative Irish community in the United States, as well as the fact that Woodrow Wilson’s ancestors in 1807 had emigrated to the States from ates from Strabane, County Tyrone, Ireland (now Northern Ireland). The Irish delegation, led by Seán T. O’Kelly President of the Dáil, arrived on February 8, 1919 in Paris, with the message of which we just mentioned a step: but U.S. President Wilson refused to admit the Irish to the Conference. In March 1919, however, the Congress and then the United States Senate approved a motion to support Irish independence, so the president was forced to authorize an American Commission on Irish independence, led by Frank P. Walsh, to travel to Paris, where he arrived on April 11, to conduct a series of exploratory talks with the Irish, with Wilson himself and Lloyd George. Also on this occasion, Wilson expressed a clear willingness not to address the Irish issue in the context of the Conference, which was to be dealt with only the territorial settlement of the losers. Thus, the Commission was sent to Ireland, where it arrived on 3 May: during the talks with various independentists, the members of the Commission confirmed their intent to “ensure the recognition of the Republic of Ireland at the Peace Conference”, a position that, on their return to Paris, Wilson seemed not to like so much, in fear of alienating the British ally. Wilson strided Walsh and the others, accusing them of ruining everything (kicked over the apple cart) with their public speeches. It was therefore clear from that moment that the Irish question would no longer be dealt with at the Paris conference. Éamon de Valera, one of the most important protagonists of this tragic season, had been an easy prophet in March when he said to the English people: “If the Paris conference fails to extend self-determination to Ireland, violence will be the only Alternative remained to the Irish patriots”. It should not be forgotten that in the same historical 21 January 1919, the day of the solemn proclamation of the independence of the Republic of Ireland, two militiamen of the Royal Irish Constabulary (RIC), the police forces recruited among the Irish Protestants Anti-Catholics, were ambushed by separatist armed militants in Soloheadberg, opening up a very long season of violence that would have bloodied the troubled island for decades. After the fatal failure in Paris, in 1920 O’Kelly would have travelled to Italy, to speak with the Pope and to obtain the support of the Catholic Church in the Irish cause, but also to seek contact with Gabriele D’Annunzio, whose impresa di Fiume, initiated in September 1919, was explicitly opposed to the English imperialism, to support the oppressed peoples, including the Irish themselves. A rather complex plot of relations led, according to some reconstructions, the Irish envoys to Benito Mussolini, who would put an Irish emissary in contact with the Italian Ministry of War in Rome, where on November 21, 1920 a meeting, apparently very profitable for the Irish cause, was held: a high officer and a civilian (some identified him even in Ivanoe Bonomi) would have established the supply of as many as 20 thousand rifles, 500 machine guns and five million cartridges to the Irish independentists. The Paris conference had therefore once more demonstrated how the theme of the self-determination of peoples, proclaimed by the Fourteen Points as the spearhead of Allied war propaganda, was a pure instrumentum regni to dominate in Europe, with really terrible consequences for the history of our continent.